Fellow Svengoolie pals will be jumping for joy this weekend as he will be showcase a vintage Universal Studios thriller with two iconic screen legends. 1936 Universal Studios trailer for “The Invisible Ray” (with Realart re-issue end titles). The legendary Chicago/Berwyn-based horror film host will be showing “The Invisible Ray,” this Sat., Aug. 19 at 10 p.m. Eastern/9 p.m. Central on Me-TV. The film was directed by Lambert Hillyer, who also directed “Dracula’s Daughter” (which was also released by Universal in 1936) and the 1943 Columbia Pictures “Batman” serial film series. This will be Sven’s fourth telecast of “The Invisible Ray” on Me-TV. He had previously shown the 1936 Universal Studios thriller in June 2013, Jan. 2014 and May 2015. The players who appeared in Hillyer’s screen thriller were Boris Karloff (as Dr. Janos Rukh), Bela Lugosi (as Dr. Felix Benet), Frances Drake (as Diane Rukh), Frank Lawton (as Ronald Drake), Beulah Bondi (as Lady Arabella Stevens), Walter Kingsford (as Sir Francis Stevens) and Violet Kemble Cooper (as Mother Rukh). According to the American Film Institute’s database article on “The Invisible Ray,” several interior sets from Universal’s first “Flash Gordon” serial film adaption series were used (the Buster Crabbe “Flash Gordon” serial series was also released in 1936). For the marriage scenes in the church for Frances Drake and Frank Lawton’s characters, the studio used interiors that were originally designed for the 1923 film adaptation of “The Hunchback of Notre Dame,” according to IMDB. 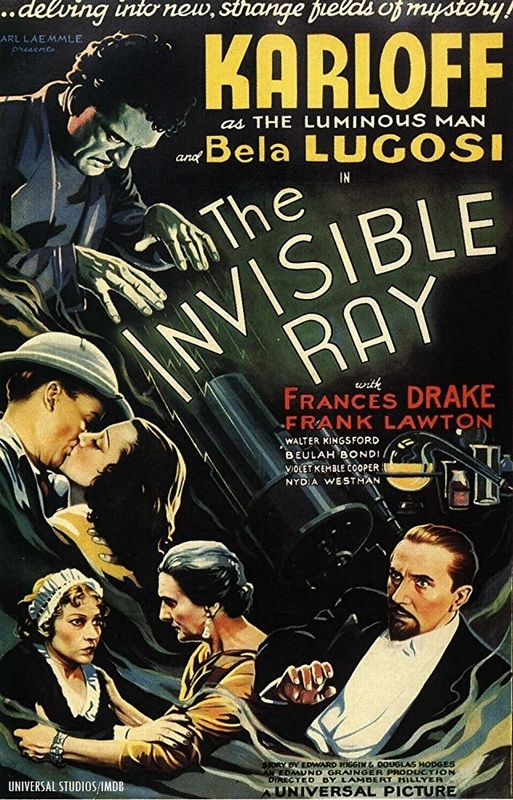 According to additional information from the American Film Institute, footage elements from “The Invisible Ray” were recycled in Universal’s 1939 film serial, “The Phantom Creeps” (which also featured Bela Lugosi). During the production of “The Invisible Ray,” veteran studio cinematographer John Fulton worked on the special visual effects for Hillyer’s thriller feature. According to an article in the 1936 issue of the studio’s publicity magazine, Universal officials did not divulge Fulton’s process for the visual effects techniques that he employed in the film. 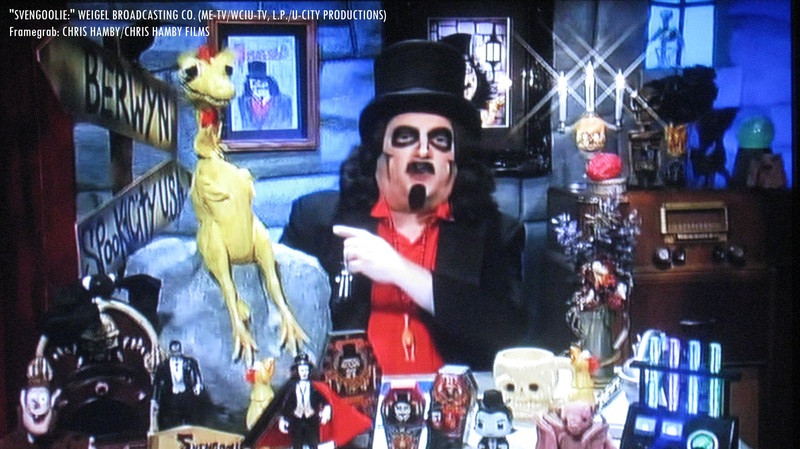 Be sure to watch (or record) Svengoolie’s showcase of “The Invisible Ray” this Sat. on Me-TV! 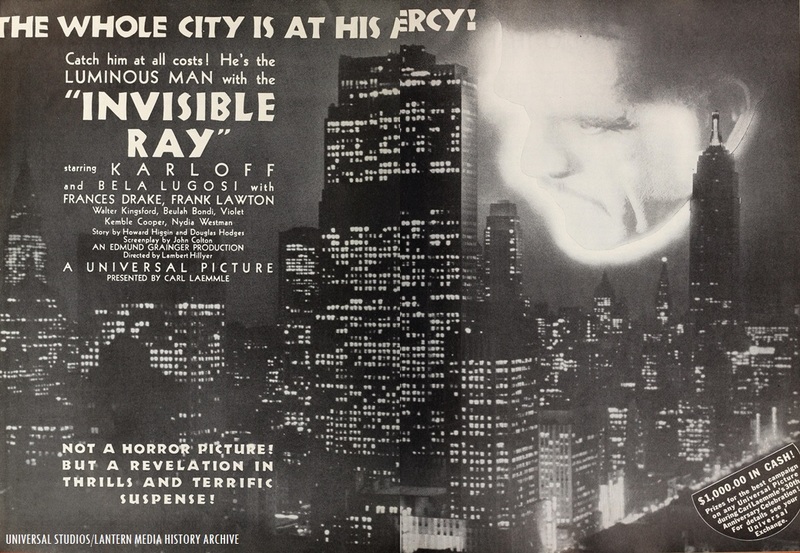 1936 Universal Studios publicity ad for “The Invisible Ray.” Wonder if any theaters that showed the film won Universal’s $1,000 promotion prize contest (on the bottom-right of the ad)? Svengoolie (portrayed by Rich Koz) and Kerwyn! With Boris, Bela and an ensemble cast, you will not be disappointed in Svengoolie’s showcase of “The Invisible Ray” this Sat. on Me-TV! Highly recommended for all fellow fans of Universal thrillers with the magic of Sven, Doug and Kerwyn! Join in on the fun with us fellow SvenPals from coast-to-coast! Live-tweet (during Svengoolie’s big broadcast) with fellow super Sven fans (by using “#Svengoolie” on Twitter)! Questions/Comments about Svengoolie or “The Invisible Ray” (1936)? Drop a line at the comments section! The Invisible Ray and the Black Cat (1934) – which Svengoolie aired November last year – are two of my favorite non-Frankenstein films pairing Karloff and Lugosi. Lesser-seen Universal titles like these, along with The Raven (1935) and Black Friday (1940) are one of the reasons I’m grateful for Svengoolie and MeTV for continuing to air these Horror classics. One of my many favorite Karloff-Lugosi Universal cinematic pairings as well (kudos to Svengoolie, Me-TV and their Sat. evening Universal horror/thriller showcase)! Looking forward to watching Svengoolie’s presentation of “The Invisible Ray” (and live-tweeting Sven’s showcase with you and all fellow SvenPals from coast-to-coast) this Sat. on Me-TV! P.S.- I’ve also updated the photo links (on the WordPress platform, for “full-screen” size versions of the photos featured in the blog post on Sven and “The Invisible Ray”).